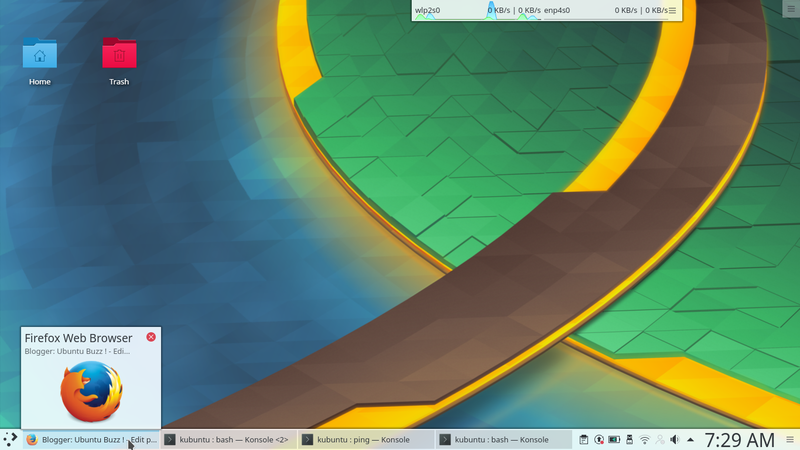 The latest KDE Plasma 5.10.5 is available for Kubuntu 17.04 "Zesty Zapus" at 24 August 2017. It's available via Kubuntu Backports PPA. For your information, the latest Plasma itself released at 22 August. Now, if you're a Kubuntu 17.04 user, you can upgrade your Plasma either fully or just partially for some components you like! Read the simple instructions below. This 5.10.5 is a bugfix update to previous release. You can do either full upgrade (the whole system) or just partial upgrade (particular components only) if you wish. Added new translations and fixes. Fixed a Plasma Desktop crash when grouping certain apps on taskbar. Fixed OSD included in desktop grid view. Fixed Plasma Discover (the KDE's software center) in many ways, including URL handling. This should says the latest version (upper position) is 5.10.5. Upgrade size is around 470MB (warning, it's huge!) on a freshly installed Kubuntu 17.04. Before upgrading, read the full list of being-upgraded packages + their version changes in this TXT file full-upgrade.txt. Use option -V to see the list of version changes.